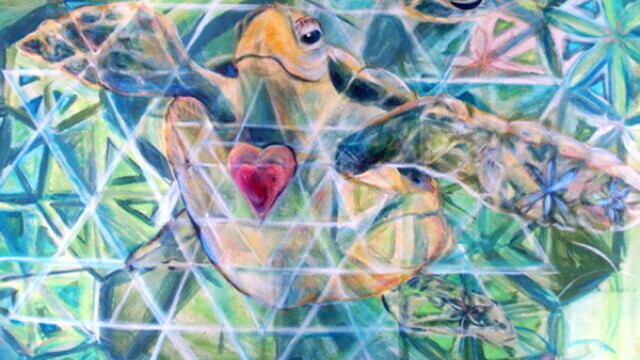 With Earth Day in recent memory, it seems appropriate that Tangled Up in Hue, an artist collective in downtown Eau Claire, is featuring the works of Magic Mama. Known best as an area musician, Magic Mama describes herself as an “eco artist to the max,” and at this reception people will have a chance to see just what that means. Magic Mama works in mixed medium found object art and layered paintings. Her works highlight connectivity with both the sacred feminine and unity with the greater community. At the reception Magic Mama will also be playing some of her new music in a looped performance geared specifically for Tangled Up in Hue. Magic Mama made her first albums specifically for children. She describes her current work as, “Trying to merge my adult music and my kid music for the whole village … the focus is on our source of food, sustainable communities, and finding joyful ways to change the paradigm with which we live in.” The reception will begin at 6pm on May 6.